Where some people are content to leave things at “pretty good” or realize, quite correctly, that most of the little details in their work will likely never even be noticed by others, I’m the guy adjusting the light behind the toy ship in my video’s background to get the silhouette just right. However, over the past few years I’ve learned how to manage my perfectionism, and for the most part it doesn’t hinder me too much. Perfectionism isn’t always just a tiny problem to laugh at and blame your procrastination on. For some people, it can be a big issue. Now, it should be stated before we move on that perfectionism isn’t all bad. In fact, many psychologists divide perfectionism into two categories: Adaptive and Maladaptive. Adaptive perfectionists are motivated by their high standards. They pursue their goals without compromising their self-esteem, aren’t hyper-critical of their work, and channel massive amounts of energy and focus into pursuits that require effort and attention to detail. Maladaptive perfectionists, on the other hand, feel constant pressure to meet unrealistic standards. Their perfectionism can cause them to procrastinate, and they often deal with anxiety and even depression due to their inability to meet the high ideals they feel they’re expected to meet. Now, I don’t believe these are binary states – there’s certainly a spectrum between perfectionism of the adaptive and maladaptive sorts. What this means is that if you can reign in your perfectionism – if you can utilize the positive qualities in a controlled manner while mitigating the negative ones – you’ll procrastinate less, improve your skills more quickly, have less stress and anxiety, and create more things of value. So, how do you overcome perfectionism? It’s hard to truly believe that second part sometimes because the internet surrounds us with so many finished, polished things. We’re connected to so many people… and they’re all presenting a tailored version of themselves to you. You see the products of all their hard work – but you rarely ever see all the hours it took to get there and the failures that happened along the way. Remember that those are part of the process. Embrace imperfection. Embrace mistakes. Remember when you were a kid and had to learn to ride a bike? Yeah, you fell a lot. You skinned your elbow many times. And you didn’t worry one bit about riding the bike perfectly on the first try. You just tried and tried until you got it. If you had to try and fail so many times to do something as simple as riding a bike, why do you think you can write a paper or give a speech perfectly on the first try? Just get started, and let your work become a mess. Don’t worry about the state of your project during the first stage. Just get it created in its initial rough form and let it be terrible. Feedback and constructive criticism should come once you’ve already created a prototype and are ready to start improving it. This is the practice that helps me deal with my perfectionism the most. When I started out on YouTube, I followed a lot of channels and had lots of creators I looked up to. But I realized that I’d never be able to reach the level of quality that they did on my first try – I’d spend forever trying to get my first video even close. So, instead, I decided to put myself on a weekly publishing schedule – much like I was already doing with my blog posts and podcast (the “going pro” mindset I talked about in my 2014 year-end review). …and here’s the video on how to study in a time crunch. Now, some people may say that creating deadlines and forcing yourself to finish things by a certain time isn’t necessary – that you need time to meander through a project, try things, and work at your own pace. And if you believe that, and it works for you, that’s fine. But remember the differences between adaptive and maladaptive perfectionism. If your tendency to be a perfectionist is causing you anxiety, I think setting a time to finish and move on is crucial. You need to create a structure that forces you to stop dwelling on the minutiae of one project. Focus on getting a little bit better each time. If you improve my just 1% each time you make something, over time those improvements will compound. Eventually, you’ll be a master. But you have to finish things. Calling something done, putting it out there, and having mistakes or imperfections pointed out to you… these are all parts of the learning process. Skill and knowledge are gained through countless iterations – not through creating a perfect first iteration. Regardless of whatever you’re working on right now, there are techniques and other aspects you aren’t even aware of. The skills you’ll gain making the first 9 things will allow you to hone the 10th one to a degree you didn’t even know was possible when you were on your first. Let your influences inspire you, but don’t measure yourself against them. A beginner shouldn’t measure his work against that of a master’s. If you make your first video tomorrow, you shouldn’t compare it to someone else’s 500th video. It’s not a fair comparison. Compare your work against your previous work. When drawing from other work, let it inspire you, influence you, and drive you to improve. But don’t expect the quality of your work to equal it. This is where I’m going to end this post – and to be honest, I feel it’s imperfect. There’s more I’d like to say on the topic. My brain keeps coming up with all sorts of points and objections people might bring up in the comments, and I want to cover them all. But, like I said earlier, there’s a deadline, and I have to just finish up and put it out there. It might be imperfect, but I believe it’s useful – and that’s enough. Hopefully what I did say has helped you in some way. Thanks for watching. Perfectionism can be a huge cause of procrastination – but it’s not the only one. 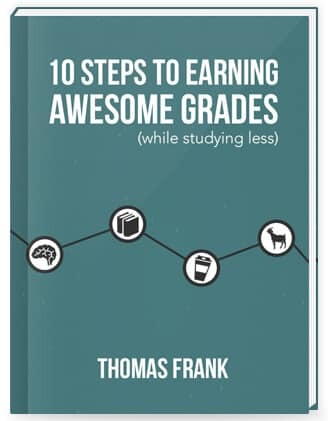 If you want to learn more about defeating procrastination, you’ll find a ton of tips in Chapter 7 of my free 100+ page book called 10 Steps to Earning Awesome Grades (While Studying Less). If you’ve got extra tips I didn’t mention here, let me know down in the comments! And yes, feel free to bring up any of the objections that I couldn’t cover in the video.